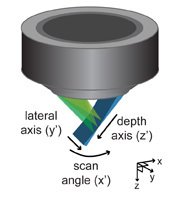 Swept, Confocally-Aligned Planar Excitation (SCAPE) microscopy is a new technique for high-speed 3D microscopy in living organisms. 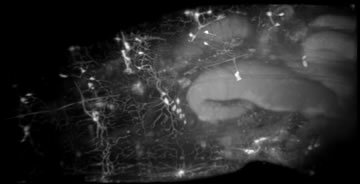 SCAPE can image intact living samples including the intact mouse brain and freely moving organisms such as Drosophila melanogaster larvae and the zebrafish heart at over 20 volumes per second. Our paper on this technique was recently published in Nature Photonics. 1) SCAPE uses a single objective lens for both illumination and detection, making sample positioning and alignment much simpler than conventional light-sheet imaging. 2) SCAPE uses an oblique light sheet which is swept through the sample using a scanning mirror, capturing images of the optically sectioned illuminated plane as it sweeps. This means that SCAPE acquires 3D volumetric images without needing to physically translate the objective lens or the sample. This feature significantly increases achievable imaging speeds, while avoiding complex sample preparation and enabling greater sample diversity. 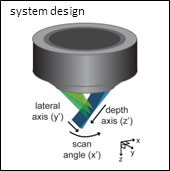 3) SCAPE's unique scanning and de-scanning optics mean that the illuminated plane always stays aligned with a stationary camera providing optical sectioning with no other moving parts. When bidirectional scanning, there is no duty cycle or overhead resulting in a simple, inexpensive system with very high volumetric imaging speeds. 4) SCAPE resolution rivals light-sheet, confocal and two-photon microscopy in living tissues. Our current prototype uses an inexpensive 488 nm CW for illumination and in transparent samples and phantoms can image fields of view 1 mm wide by 600 microns deep. Penetration is more limited in scattering tissues such as brain (as is also the case in conventional light-sheet microscopy). However, we have already demonstrated imaging of spontaneous GCaMP actvity apical dendrites of layer 5 neurons witin layers 1 and 2 of the rodent cortex. We expect future implementations of SCAPE to improve penetration depth significantly. The imaging geometry of SCAPE is shown below. The sequence of images depicts how a 3D volumetric image is formed as the oblique light sheet sweeps through the sample. The current layout of our SCAPE prototype is depicted below. The light sheet is swept at the sample by slowly moving a polygonal mirror mounted on a galvanometer motor. This alters the angle at which the light is incident at the edge of the objective's back aperture, causing the beam to sweep accross the sample. 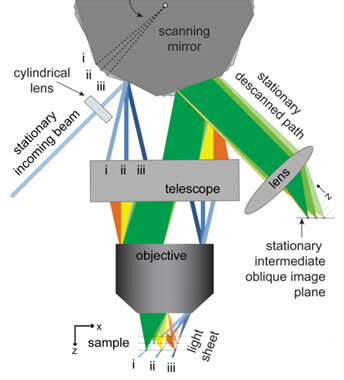 The light emitted by fluorophores within this illuiminated plane travels back through the same objective lens, and is de-scanned by the same polygonal mirror (from an adjacent facet). 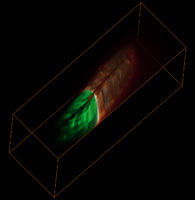 This light forms an oblique image of the illuminated plane which stays stationary, and aligned with the illumination plane, even though the light sheet is moving through the sample (just as a confocal pinhole stays aligned with the scanning illuminated focal point in laser scanning confocal microscopy). Therefore, with one (<5 degree) movement of the polygon, the entire volume is sampled. Many other configurations, including alterntives to using a polygonal mirror, are described in Bouchard et al, 2015. Additional optical components in our system take the stationary oblique image plane and map it onto the surface of a high-speed camera. We use and Andor Zyla 5.5 camera which can read out 80 rows (and 2,560 columns) of its camera chip at 2,400 frames per second. In this configuration, the result would be image volumes with 80 depths (z'), 2,560 voxels in y' and 200 voxels in x' at 12 volumes per second. For 100 voxels in x' the volume rate would be 24 VPS. Faster cameras could provide rates exceeding 100 VPS. All data shown to date has been acquired using a 30 mW or 50 mW 488 nm DPSS CW laser. The unique, single, stationary objective configuration of SCAPE mean that it can be used just like any other upright or inverted microscope. 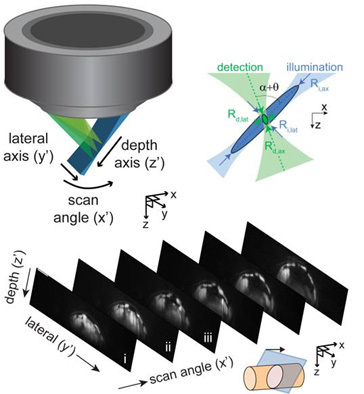 Where the conventional two-objective geometry of light-sheet microscopy has prevented its use for imaging the intact brain, SCAPE can achieve high-speed, optically sectioned imaging of the superficial layers of the cortex. Two-photon microscopy of the brain is limited in 3D imaging speed owing to the need to visit every point in the sample with a single scanning spot of light. SCAPE can image equivalent volumes at around 100 times faster than standard two-photon microscopy. 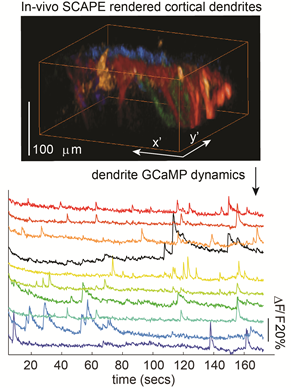 Unlike random-access two-photon scanning, SCAPE requires no a-priori information or selection of regions of interest, making it possible to capture spontaneous dynamics of GCaMP in dendritic branches in the superficial layers of the cortex, as shown below. Temporal resolution and signal to noise are sufficient to examine the onset and decay dynamics of GCaMP transients for a single spontaneous event, spatially resolved within a single dendritic tree. See Bouchard et al for full details. The movie below shows a dual-color SCAPE volume showing both blood flow and neural activity acquired in the awake, behaving brain at 10 volumes per second. Data was acquired in collaboration with Randy Bruno and Clay Lacefield. Understanding how the heart works, and how it is affected by disease requires advanced imaging tools. While GCaMP and voltage senisitive dyes have made it possible for us to visualize the electrical activity of heart cells (myocytes), it is generally necessary to paralyze the heart during imaging. A paralysed heart is not a beating heart. Zebrafish are a common model organism for understanding heart development. Their transparent bodies at their embryonic and larval stages make them ideal for light-sheet microscopy. SCAPE is capable of imaging fast enough, in 3D to capture high-density, real-time 3D imaging of the spontaneously beating heart. The video below shows the heart of a 52 hpf embryo expressing both dsRed and GCaMP in its heart muscle, acquired at 10 volumes per second. Waves of green GCaMP can be seen spreading from the atrium to ventricle, as the red fluorescence maps the position of individual cells in the heart wall. Data acquired in collaboration with Kimara Targoff and Vanessa George. Understanding the nervous system is to understand the activity of neurons during behaviour. A major goal of the BRAIN Initiative is to capture functional actvity within the whole brain, or even whole body of complete organisms. Drosophila melanogaster , fruit flies, are a commonly used model organism in neuroscience. 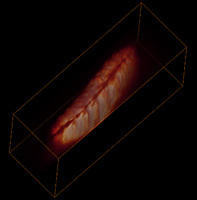 SCAPE has the ideal field of view and volumetric imaging speed to capture the whole body of freely moving fruit fly larvae, permitting us to asses not just 3D motion and structure, but the function of cells during this behavior. The video embedded above / below shows a sequence of different SCAPE data sets acquired in a range of transgenic Drosophila models expressing GFP and GCaMP. These data were acquired in collaboration with Richard Mann, Cesar Mendes and Wes Grueber. 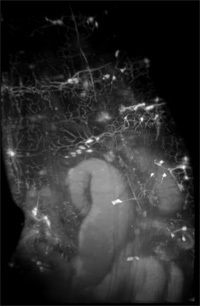 The image above demonstrates the resolution achievable using SCAPE with high-density scanning. Credit: Venkatakaushik Voleti. SCAPE imaging of cleared adult Drosophila (low-magnification ex-vivo). 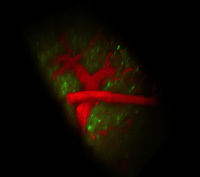 SCAPE imaging of the living brain, with green GCaMP labeling apical dendrites of layer 5 neurons, and red showing Texas red dextran in the vasculature. Data was acquired at 10 volumes per second. SCAPE imaging of mhc-GCaMP / drRed 1st instar larva showing peel-away of red channel data to show green GCaMP during muscle contraction. Credits: Venkatakaushik Voleti, Elizabeth Hillman and Cesar Mendes. SCAPE imaging of mhc-GFP 1st instar Drosophila larve showing internal heart and peripheral muscles. Rendered. Credits: Matthew Bouchard, Elizabeth Hillman and Cesar Mendes. SCAPE imaging of mhc-GCaMP / drRed 1st instar larva showing red channel. SCAPE imaging of immobilized R59G05-Gal4, UAS-CD8:GFP larva. High resolution (slow) scanning shows the high spatial resolution of SCAPE: individual neurons and their processes are visible. Credits: Venkatakaushik Voleti, Wesley Grueber. SCAPE imaging of spontaneous GCaMP signal in apical dendrites of layer 5 neurons in the living brain. Credit info below. Image shows renderings of 8 different color-coded dendrites observed to flash during spontaneous events. Credit info below. Time-courses show corresponding GCaMP dynamics from each dendritic tree. Schematic of SCAPE image acquisition geometry. Credit: Elizabeth Hillman and Cesar Mendes. 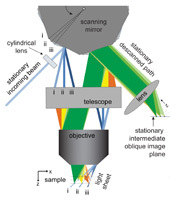 Schematic of SCAPE imaging geometry. SCAPE system diagram (full prototype). SCAPE is described in issed patent US20120140240 and is described further on Columbia's Tech Ventures site. The licensing contact for this invention and associated IP is Teresa Fazio. 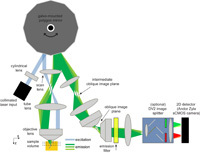 Bouchard MB, Voleti V, Mendes C, Lacefield C, Grueber W, Mann R, Bruno R, Hillman EMC, “Swept, confocally aligned planar excitation (SCAPE) microscopy for ultra-fast, volumetric microscopy of behaving organisms”, Nature Photonics, online ahead of print (2015).